Tab will be 0.8 x 6 inches. The center of it has a 1 inch diameter circle. I do not think we are looking for both A and B to be a mirror of each other, but rather to use the space in the best way to draw attention to our website, facebook, twitter and instagram. Portion C: On this portion we will we will have one of the fairies attached, either the BW or color fairy. 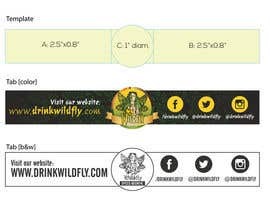 There is also the possibility that we will want our name "Wildfly" and maybe the words "Spiced Absinthe". Stoked! Jumping on this right now.